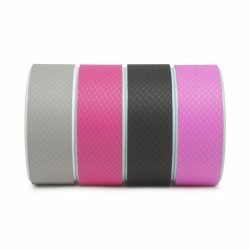 Fit Wanderlust Runner: Check Out This Awesome Yoga Wheel! Check Out This Awesome Yoga Wheel! 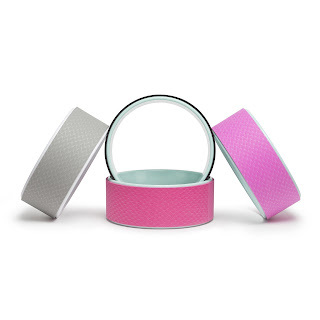 So you may have been noticing all over social media this cylinder looking thing called a yoga wheel. I started seeing it pop up on my Instagram feed about a year ago. It looked interesting and some of the pictures were of some pretty awesome yoga poses. If you have ever taken a yoga class you may have used blocks to help with poses. Well the yoga wheel is just another tool similar to the blocks used in class. The only difference is that this wheel moves! So definitely take that in mind if you are a beginner. A few weeks ago I was approached by YogaDev to try out one of their yoga wheels. I swear their little ears must have been ringing because I really wanted to check out this wheel myself. After the Chicago Marathon, I noticed my legs were a bit tight. Stretching helped but I just felt like I wasn't getting that full stretch I needed. This yoga wheel has definitely helped in that department. In just a few short weeks I have already noticed a big change. I am able to do poses I wasn't able to do at the very beginning. I have also noticed I have better balance during my poses. Little by little I'm getting better and I definitely contribute the yoga wheel to my improvements. 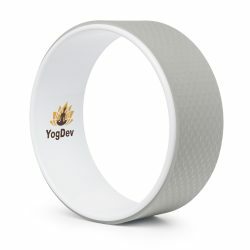 YogDev Yoga Wheel and the YogDev website. I personally was a fan of the grey and white wheel but there are other options to choose from. It is extremely sturdy and even has a nice foam layer to help out for padding. Cost wise this wheel will run you around $40-$50 so not too expensive. Have you ever used a yoga wheel? I've never used a yoga wheel, but would love to! I've been focusing more on incorporating a regular yoga practice into my routine, especially as it seems to help me so much (whenever I actually stick with it)! I've not seen this product before and it's cool. Apart from gym and gym accessories, we should take the help of some other exercise like cardio workouts and yoga practice. This is also the best way to stay fit and active. Here from this article, we can get some new techniques of yoga practice through a yoga wheel, it helps to perform better yoga and keep us fit and active. Thanks for such a wonderful review. Great stuff! I'm practicing yoga, Crossfit and fitness but first time i see that device:) Thx for video and review! I purchased my wheel on Amazon I've had it for a couple of years and use it regularly. The one I have had has given me trouble with the rubber pad. Rly awesome device.